Well, I can't say this was my best year ever, but it is ending on a good note. I was selling my shack on the Mississippi River, however the deal didn't go down last week and I am pretty happy about. I haven't been painting much lately due to the stress of thinking I was moving, but no more. I don't know if I want to keep painting landscapes and driving anymore. I haven't gone off driving a distance painting landscapes since April, I miss it but I refuse to drive a distance more than I have to. I think I will again in the future when I will need to come with paintings for shows. Next year I hope to do more paintings from my bike and boat. I have been drawing and painting some fish again. If I had my wishes I would like to publish a book of fish drawings. The top fish is a walleye and the bottom is a sauger. 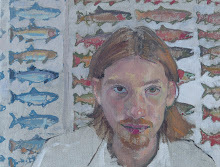 I work only directly from life and I don't go back into the fish paintings/drawings to make them perfect. I want the feeling like someone was there looking and admiring.